The Hillsborough County MPO (Metropolitan Planning Organization) Committee hears the petition of area residents and members of the Brandon Chamber in connection with the Lithia Pinecrest Rd. widening project, specifically involving Segment B, the section between Lumsden Rd. 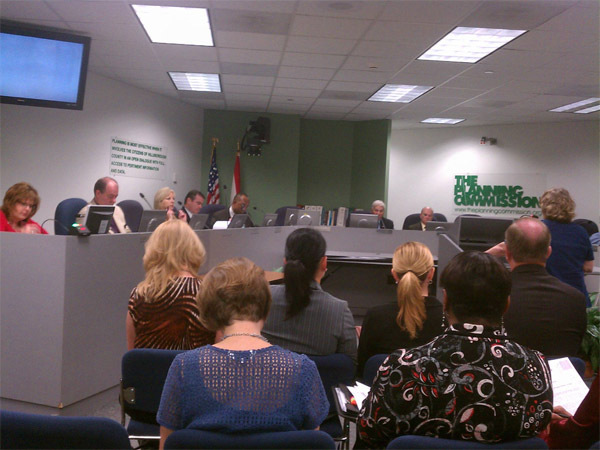 and Bloomingdale Ave.
Members of the Brandon area business sector as well as local residents got a chance to be heard last month during the Hillsborough County Metropolitan Planning Organization (MPO) Committee meeting, in connection with the Lithia Pinecrest Rd. widening project, specifically involving Segment B, the section between Lumsden Rd. and Bloomingdale Ave. The project covers an approximately 11-mile section involving the expansion of the roadway from its current two-lane to a four or six-lane roadway, from S.R. 60 in Brandon to C.R. 39, affecting residents in Brandon, Valrico, Bloomingdale and Lithia, including those living in FishHawk. Drawing attention to the MPO’s long range plan and the PD&E study, Laura Simpson, vice president of the Greater Brandon Chamber of Commerce asked the committee to support the expansion. “At this time, there is merely a plan to provide a two-lane enhanced roadway along this portion of the corridor; however, professional recommendations suggest the need for a four-lane expansion as a minimum,” Simpson said. State Farm Insurance Agent Melissa Snively, who—in the name of progress—also hoped to convince the MPO board, of the need of expansion, spoke next. None of it, however, convinced community advocate George Neiman, who quickly brought the discussion back to where he felt the need was to begin with. Using her three minutes to speak, Pamela Flaherty, of Valrico, on behalf of her parents and their home of more than three decades, “Never in their wildest nightmares did my parents ever think that they would lose their home and property to suburban sprawl,” Flaherty said, adding that she would like to keep her family home of 32 years, the businesses that serve her needs and the entire neighborhood community intact. “I’m actually angered that the chamber thinks it is their right to demand somebody’s property be taken to help their commute,” she said. According to Flaherty, the project means the loss of property, forced relocation of at least 17 mostly small businesses, a church congregation and eight homes, not to mention the 77 front yards, which she said will be taken by right-of-way acquisition making it unsafe, noisy, intrusive and downright unlivable. Residents also came to the meeting with more than just their objections. Instead of an expansion, Neiman said that the traffic on Lithia Pinecrest is really the result of people trying to find alternates to the main problem; the lack of capacity for the other direction. “Our problem is east/west, not north/south,” he said, adding that motorists are not on Lithia Pinecrest because it is the shortest route or more direct, but because Lumsden and Bloomingdale are way too crowded. As the debate continues, members of the MPO board agreed to the necessity of devoting one of its meetings exclusively to the Lithia Pinecrest Road widening project before moving any further. For more information, please visit www.hillsboroughmpo.org.